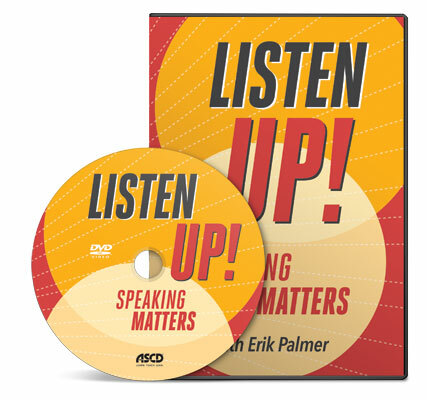 Veteran teacher and author, Erik Palmer, presents an approach to teaching speaking skills that is focused on preparing students for 21st century communication both inside and beyond the classroom. You’ll visit elementary, middle, and high school classrooms where teachers are guiding and assessing students in collaborative discussions, media literacy, questioning and reasoning, speech presentation, effective multimedia use, and adapting speech to different content and tasks. All teachers at all grade levels in all subjects have speaking assignments for students, but many teachers believe they don’t know how to teach speaking, and many even fear public speaking themselves. In this thoughtful and engaging book, veteran teacher and education consultant Erik Palmer shares the art of teaching speaking in any classroom. Where would we be without conversation? Throughout history, conversations have allowed us to see different perspectives, build ideas, and solve problems. Conversations, particularly those referred to in this book as academic conversations, push students to think and learn in lasting ways. Academic conversations are back-and-forth dialogues in which students focus on a topic and explore it by building, challenging, and negotiating relevant ideas. Read the selection “Literacy Work Stations,” an excerpt from Growing Independent Learners. Plymouth Massachusetts has provided lessons for their district’s 3rd grade persuasive speech unit. How to write an opinion piece and how to deliver a persuasive speech are included here. Why don’t schools teach speaking? Voice 21 is an organization in the UK committed to expanding emphasis on oral communication. This link will take you to their report which discusses in depth the issues facing educators committed to improving speaking skills.